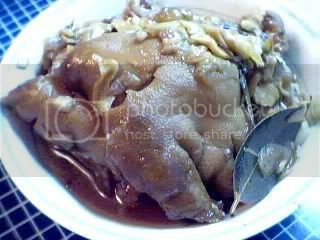 I have been tracking Manang’s posts on the unwanted parts of pork, and she got me hankering for something sinful, and I have been eyeing these pig’s feet at the grocery store for some time but I wasn’t sure how to cook them. So I too referred to Sassy’s recipe for paksiw na pata. I used dried lily buds like Manang since I don’t have bulaklak ng saging as Sassy’s recipe called for. As usual, I was the only one who ate this. Hubby tasted the sauce and liked it, but he said the rest of the stuff was too fatty. He put the sauce over his rice. Asi tasted it and liked it too. Jade and the Clone won’t even taste it. Oh well, more for me. I had to put half in of it in the freezer though, so I won’t overdo it. Still gotta watch the fats, you know :). it’s ok JMom, once-in-a-while indulgence is good for your soul…and belly heehee. nagimas ket daytoyen, manang, mmmmmm! padasekto man a lutuen no makaurnos datao kalpasan ti bagyo ken layus….